As part of an ongoing effort to improve the quality of iPhone voice calls, Apple is investigating a unique take on bone conduction technology that uses sensor-laden EarPods and multiple microphones to cancel out unwanted noise. 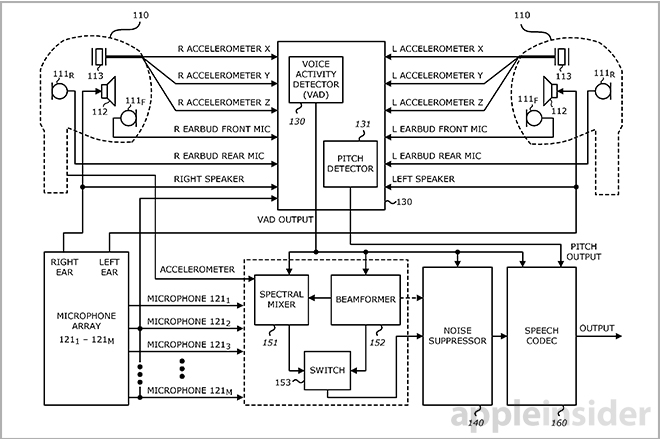 Apple's technology is outlined in a patent filing titled "System and method of mixing accelerometer and microphone signals to improve voice quality in a mobile device," which was published by the U.S. Patent and Trademark Office on Wednesday. 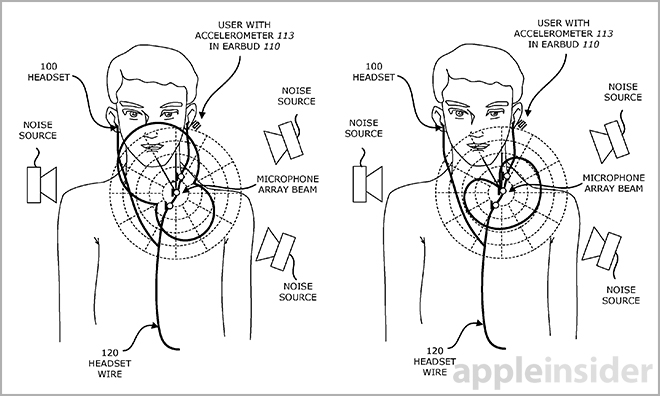 The invention proposes a set of EarPods, or similar earphone device, be fitted with accelerometers to detect vocal chord vibrations that propagate through a user's skull when they speak. Using output data generated by the sensor and a microphone array disposed within at least one earbud, a spectral mixer creates a mixed signal for parsing out non-vocal noise. To detect voiced and unvoiced speech, the accelerometer may be tuned to sample low frequency vibrations indicative of such signals. By measuring output signals, the invention effectively creates an accelerometer-based voice activity detector (VAD) capable of distinguishing voiced speech from ambient vibrations. At the other end of the equation are microphone arrays that monitor acoustic signals for a user's voice. 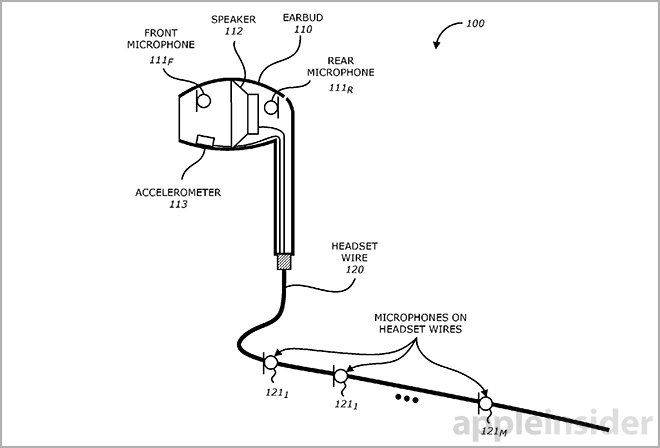 Apple mentions inclusion of both front-facing and rear-facing microphones in a single earbud, as well as optional embodiments with sets of mics installed along the device cable that come together to create a beam forming array. As with the accelerometer-based VAD, the acoustic version recognizes voiced and unvoiced speech, but at a naturally higher energy level. Apple compensates by conditioning and amplifying the accelerometer VAD signal to levels sufficiently equal to microphone output. This is key to the process as the two signals will be analyzed against one another during the noise canceling operation. To mitigate errors in voice pickup, the accelerometer and microphone output signals are compared and contrasted, meaning final VAD output is an "and" function of the two VAD systems. Applying threshold analysis to the power signals results in a speech-to-noise power signal that can then be fed to a noise suppression module. To reach an accurate assessment of ambient noise, a spectral mixer generates a final output signal by removing the respective noise power signals from both microphone and accelerometer power signals. Finally, a switch feeds the final VAD output through for transmission, while a noise suppressor removes unwanted environmental noise from the signal. Alternative embodiments include closed type earphones, mono-signal earbuds and variations on the spectral mixer. Other technical considerations like amplification levels are also detailed. It is unknown if Apple is working to make bone conduction headsets a reality, but the company has already taken steps to deploy noise cancellation technology in its devices, as evidenced by dual-microphone setups for its iPhone and MacBook product lineups. 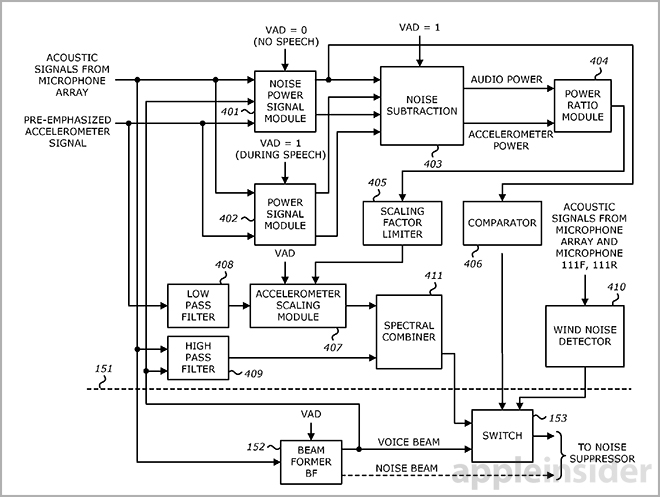 Apple's bone conduction noise canceling earbud patent application was first filed for in March 2013 and credits Sorin V. Dusan and Aram Lindahl as its inventors.